USDJPY is under the influence of some economic reports such as the Retail Sales y/y in Japan and the US is releasing Bank Stress Test Results, Crude Oil Inventories, Pending Home Sales m/m, Personal Income m/m, Personal Spending m/m, and the Core PCE Price Index m/m. The pair started today with bearish bias below the monthly pivot point. . 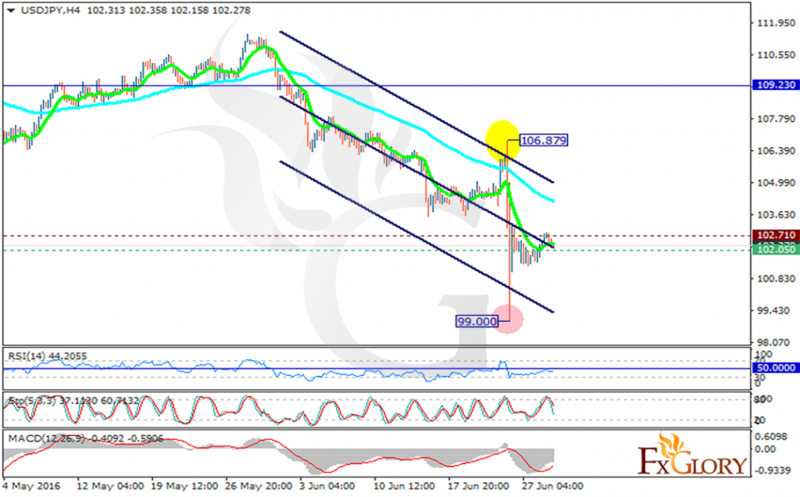 The support rests at 102.050 with resistance at 102.710 which both lines are below the monthly pivot point at 109.230. The EMA of 10 is moving horizontally below the EMA of 75 which is falling down the descendant channel. The RSI is moving in neutral zone, the MACD indicator is in negative territory but it is trying to rise while the Stochastic is showing downward momentum. The pair does not seem to be moving a lot today and it will fluctuate around the 102-103 zone.